Dr Steven King, a former advisor to David Trimble, is accused of plagiarising columns from a British political blog. 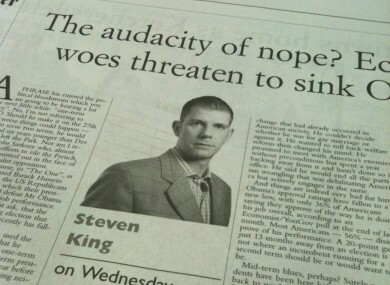 A Steven King column from yesterday's Irish Examiner is among those alleged to include plagiarised content. THE IRISH EXAMINER says it is investigating substantial allegations of plagiarism against one of its columnists. Steven King, who writes about international affairs in a weekly column for the newspaper, is accused of copying lengthy passages for his columns from the output of Brendan O’Neill, the editor of British-based blog Spiked. In a tweet this morning, the newspaper’s editor Tim Vaughan said the claims were a “very serious issue” and that the newspaper was awaiting a response from King to the allegation. Evidence of the plagiarism was uncovered by journalist Brian Whelan, whose blog this morning published examples of seven King articles which seem to rely heavily on passages taken from O’Neill’s columns. In one case – a column published by the Examiner in July – there are at least three paragraphs which bear striking similarities to an O’Neill column from 2008. Whelan wrote on his blog that he had been in contact with O’Neill regarding the similarities, and had been assured that King was not given permission to use passages from his work. DIT journalism lecturer Harry Browne subsequently uncovered further examples of potential plagiarism, in King’s column published yesterday. That column – dealing with the prospect of Barack Obama losing next year’s US election – carries similarities with pieces published on Salon.com and in Commentary Magazine. Whelan had previously helped to uncover accusations against London Independent columnist Johann Hari, which resulted in Hari being stripped of his 2008 Orwell Prize and suspended from duty at his paper. Hari is now on unpaid leave from the Independent. Email “Irish Examiner investigating plagiarism charge against weekly columnist”. Feedback on “Irish Examiner investigating plagiarism charge against weekly columnist”.